This is a 12PK of quart sized Green Glue Noiseproofing Sealant tubes. If you don’t need a whole case we also carry individual tubes. No soundproofing job is complete without Green Glue Noiseproofing Sealant. Cracks between walls, ceilings, and floors compromise the sound isolation of any room by allowing noise to penetrate into adjoining rooms. 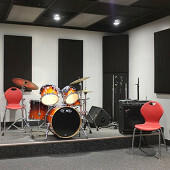 Simply adding Green Glue Noiseproofing Sealant to your soundproofing project can reduce noise transmission by 100 times or more. 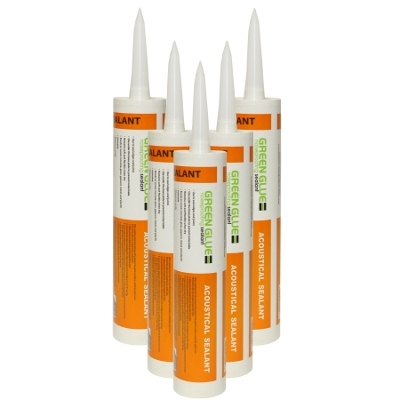 Green Glue Noiseproofing Sealant can be applied as easily as any standard calking material. 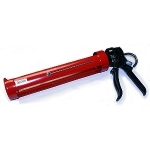 It fits into a quart-sized calking gun and is applied along the edges and joints between floors and walls and ceilings and walls for maximum performance. Green Glue Noiseproofing Sealant can also be painted once dry. Green Glue Noiseproofing Sealant exceeds LEED green building requirements, is low V.O.C., and is low odor. It can be easily cleaned while still wet with soap and water. Coverage: 85 linear feet of 1/4" bead, 40 linear feet of 3/8" bead. Due to a change in dealer terms from the Green Glue Company we are no longer able to offer discounts on Green Glue products. Bulk quantities? Specially sorted cases of different sound isolation materials? You name it! Just give us a call toll-free at 1-866-787-7881. They work and look great. Thanks for the great service! The panels are outstanding! Thank you for your consultation and working with my requirements. The panels were very easy to install as well!